This has been a very busy week. Monday was Memorial Day. I had an all-day textbook training on Tuesday. Wednesday featured a New Hire Meeting at my new school where I got to fill out fun paperwork. Tomorrow (Friday), I am meeting with a team to do some curriculum writing for the state department this summer. This means that a lot of the stuff that I need to get done this week has ended up on today's to do list. 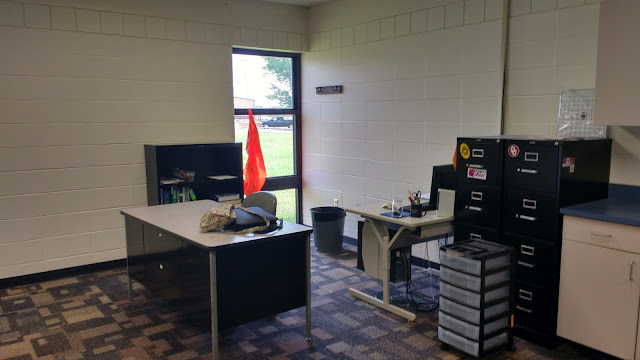 So, in the interest of procrastinating on said to do list, I figured I would give you a peek at my classroom for next year. I was able to get keys to my classroom on Tuesday, and my brain is already running with ideas of how to decorate it! 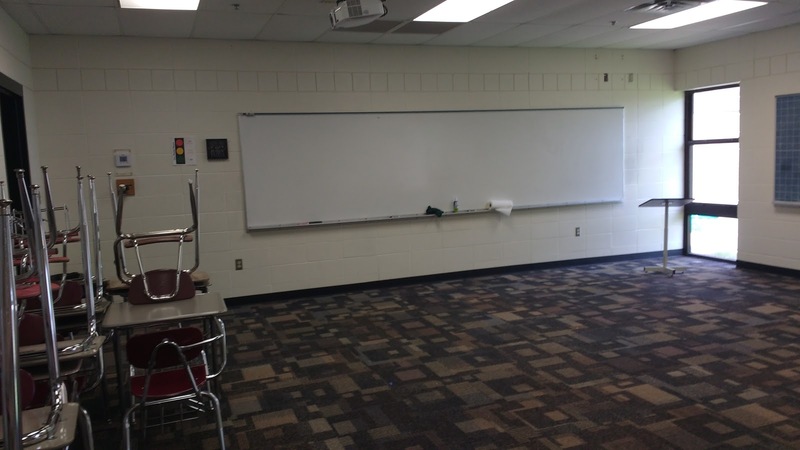 This will be my third new classroom in three years. So, I've gotten quite used to decorating new spaces! In case you missed the announcement, I will be teaching at a new school starting in August. After six years at Drumright, I'm returning to Coweta High School where I graduated from in 2008. It's super exciting to be coming home. I've already had a few back-to-school nightmares about my new/old school, though, and it's only May! And, here's the view of the other side of that door. 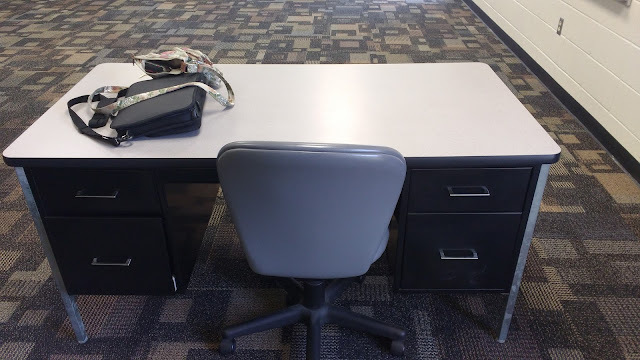 I was able to score a rolling table/cart thing that the library had decided to get rid of to sit right by the door. I'm hoping to be able to put hand-outs on that table for kids to pick up when they walk in so I don't have to hand them out myself. I will have much larger class sizes than I'm used to, so I need to find as many ways to save time and become more efficient as possible. The first thing my principal said when he showed me my classroom was that I would definitely not be disappointed in the amount of whiteboard space. He was right. Here is the first of three whiteboards. The second wall of the classroom features two windows, a chalk board coordinate plane, and another whiteboard. After having a dry erase coordinate plane for the past six years, I think I'm going to have a hard time getting used to using chalk. Luckily, I found a box of boxes of chalk that another teacher was getting rid of. So, I don't think I will run out of chalk for the next century. The podium in the corner turned out to be broken, so it had to go. But, that's okay because I have a wooden podium that my mom found at a garage sale that I've been using for the past few years. It even has built in storage! The other window on this wall is by my desk corner. I actually have two desks, and I'm not entirely sure how I feel about that. I do love the fact that there is a coat rack hanging on the wall because usually I just end up tossing my coat on the back of my chair only to have it fall off fifteen times a day. 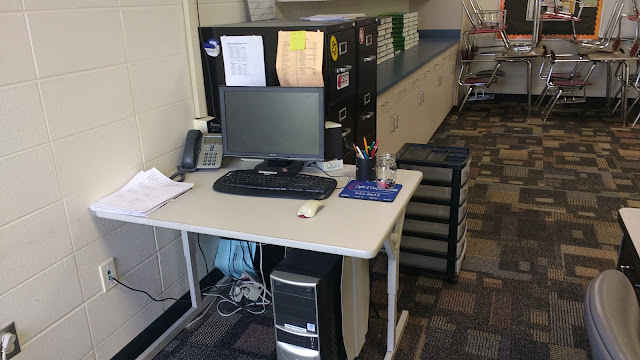 The classroom I just left had a giant desk, so this one is going to take some getting used to. I got a bit spoiled the past two years by having lots of hanging file storage in my desk. But, I did manage to snag an extra filing cabinet that someone was getting rid of. It's not in the photo, but I think I will set it up next to my desk for extra storage. I am super excited about this bookshelf, though. I've never had a good place to store textbooks/binders by my desk so this is a HUGE plus. Here's the view from my second window. This is my computer desk. I was super excited to see that they have already programmed my name into the telephone. 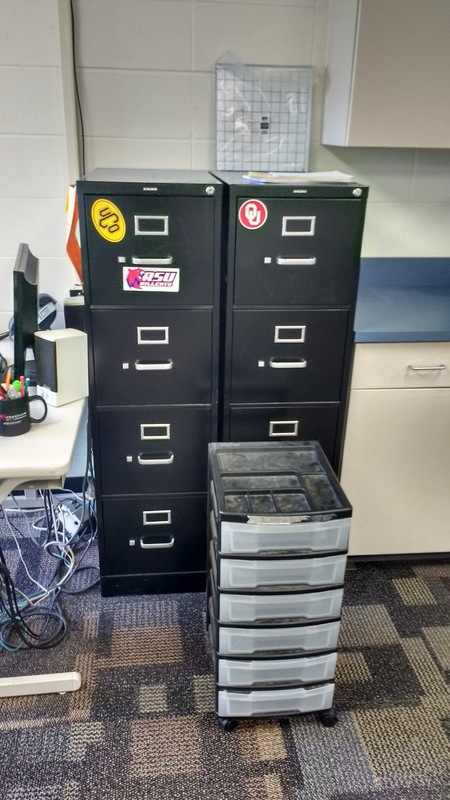 These filing cabinets are going to come in super-handy with organizing all of my laminated activities. 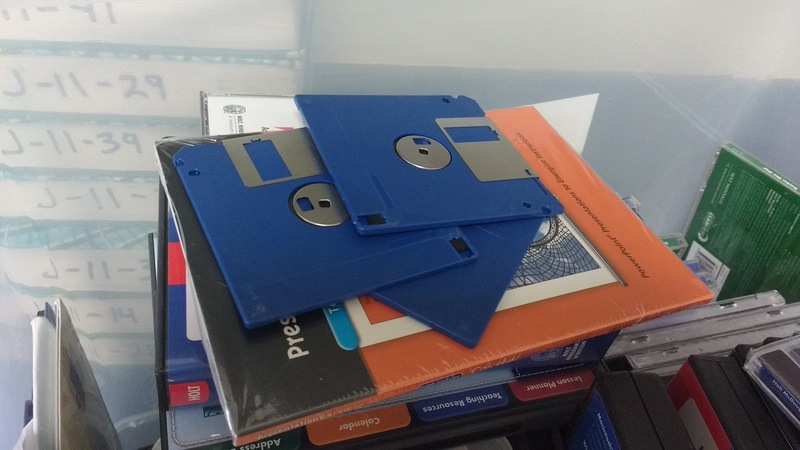 In the past, I've sorted them alphabetically. But, I'm thinking that with eight different drawers that I will sort them first by subject, then alphabetically. For example, I want to have separate drawers for posters/decorations, games/puzzles, algebra activities, trig activities, science activities, etc. I'm sure this rolling cart will be useful for something. I haven't figured that out yet, though. Maybe supplies for students to access??? I was excited to find a magnetic coordinate plane on top of the filing cabinet. I haven't put it together yet, but I'm thinking that will end up being super useful. Up next, my wall of cabinets. I've been spoiled by having a wall of cabinets for the past two years, so I was very worried when job hunting that I was going to have to give them up. So glad I don't have to! See those piles of textbooks? 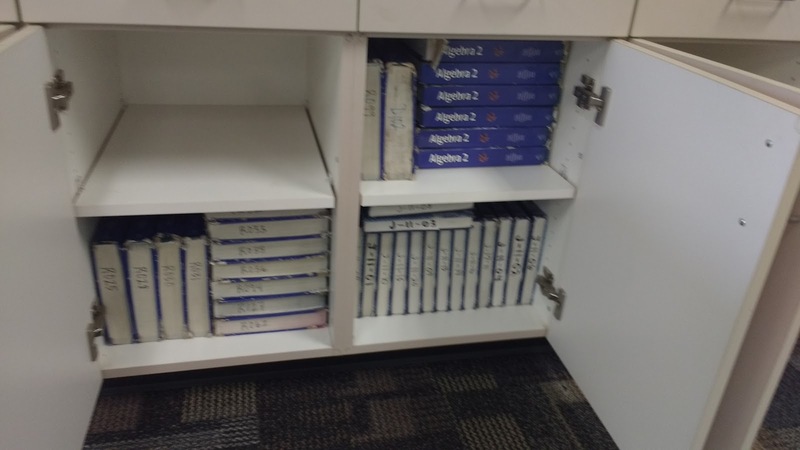 Thanks to the help of my amazing husband that Algebra 2 books have been carted off to the surplus storage area, and the Pre-Calculus books have been moved to the giant cabinet on the far end. 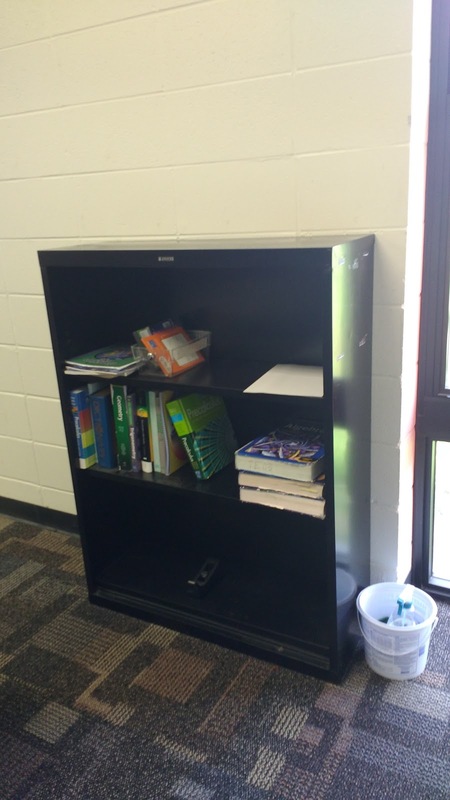 That cabinet also now houses Trig books and Calculus books. SO many books. We are adopting new books for next year, but they are all digital. I don't know how that's going to go, so I'm holding on the to Pre-Calc books just in case. My principal is hoping to bring back Calculus in the next few years, so I didn't want to get rid of the calculus books in case that does end up happening. I guess it's my job as the pre-calc teacher to inspire enough students to sign up for calculus in order to make it happen. Of course, I think that means I will then have to learn to teach calculus which could be interesting. 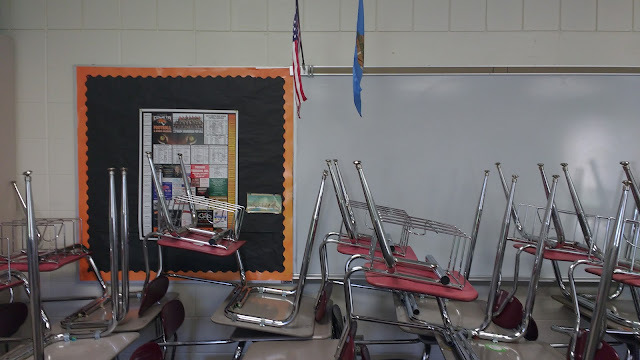 The Algebra 2 books were Common Core aligned, and we are no longer a Common Core state, so I didn't feel the need to keep those since the digital books we adopted are much-more aligned to the Oklahoma standards. And, the books on the counter were just the start. Almost every one of those cabinets had even more textbooks in them! 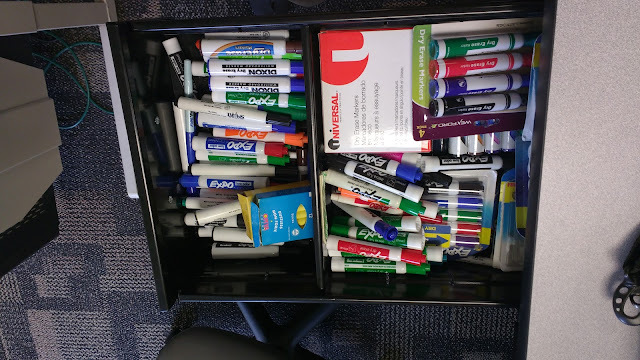 I had to clear them out to make room for my own teaching supplies. I originally took a photo of this tall cabinet because it was locked, and I couldn't find the key. My husband ended up being able to get it open for me. 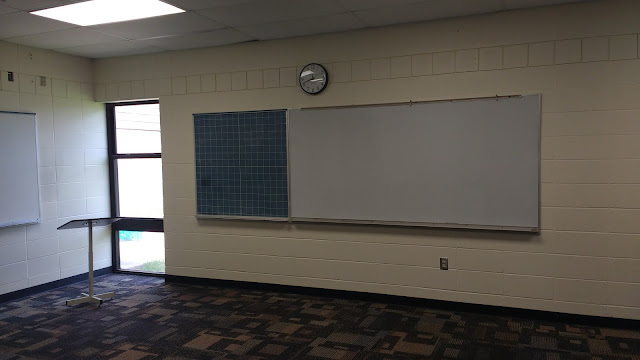 The next wall features a bulletin board, and the third whiteboard. I'm used to having more than just one bulletin board to decorate, but I will still have plenty of wall space to decorate. 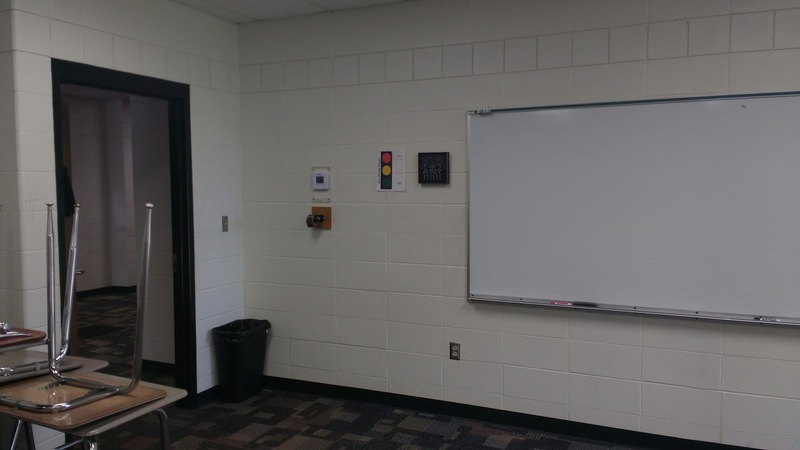 There is also a SMARTBoard on this wall. 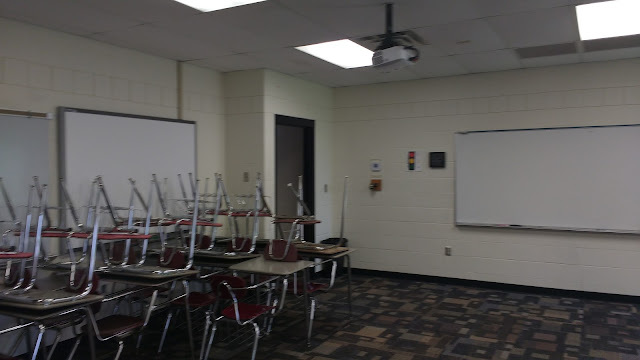 The school is slowly phasing out the SMARTBoards, so I've been told that a 65" TV will be installed over the summer to replace the SMARTBoard, and I will be given a tablet to write on that will project on the TV. 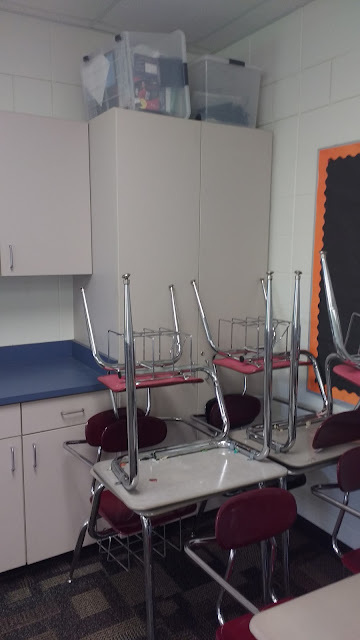 I'm not sure if this means they will take the SMARTBoard down and put the TV there or if they will put the TV somewhere else... I guess I will just have to wait and see! 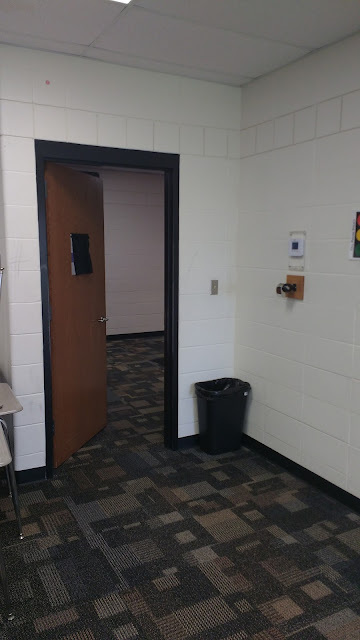 And, now we're back to the door, so I guess this concludes the end of my new classroom tour. Yesterday, my husband and I spent hours tossing out pile after pile after pile of papers from every drawer imaginable. I was excited to find a nice stash of dry erase markers that will definitely come in handy with dry erase boards on three out of four walls! Of course, most of my other finds were much less exciting. Unlabeled floppy disks, anyone? 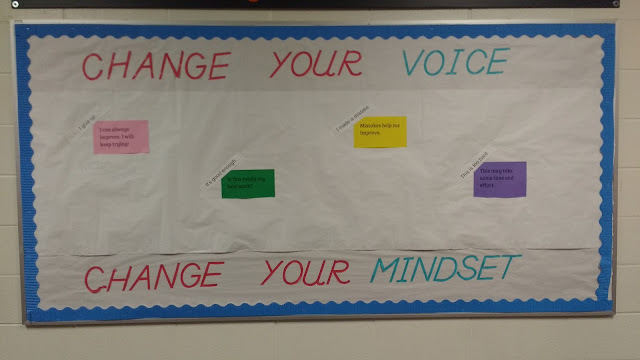 I also can't help but share a photo of the bulletin board directly outside my new classroom. You might remember a similar bulletin board that I put up in my classroom in 2014 that went viral on twitter and pinterest. It's very cool to realize that something I did in my classroom four years ago has had an impact on students in my own hometown. Okay, one last thing and I promise I will end this post and get up to something that's actually productive. I learned this week that each department at my new school has a mission statement. How cool is that?!? If you have any decorating ideas, I'd LOVE to hear them! It's Monday yet again! That means it's time to round-up as much of the awesomeness of twitter as possible. I hope you enjoy this peek at what I found inspiring this week. As more and more schools finish for the summer, these posts will likely become more and more infrequent until school starts back up in the fall. Petteri Forselius, a math teacher in Finland, inspires with some awesome outdoor constructions. Chris Smith shares a fun number fact. If you're not subscribed to his free weekly email newsletter, you are missing out! Send Chris an email at aap03102@gmail.com to sign up! Roger Mansuy shares a photo of a great, visual multiplication table. Grabarchuk Puzzles shares a fun tangling sticks puzzle to challenge your students with. Max Goulding highlights an awesome logarithm based lattice puzzle. Ella Dickson blows my mind with these maths biscuits (or math cookies for American readers). Ed Southall shares a fun probability fact. Jonathon Smith offers up a way to help students unpack the lesson objective. I like how he makes the distinction between what students need to do and know. I love how Sarah Suydam makes word problems into an event to be anticipated. James Edstrom shares a fun, math-y end of year project where students write their names in math symbols. David Butler takes Quarter the Cross to an entirely new level. Over the years, I've given the assignment to write a letter of advice to future students. But, Mrs. Stelzer takes this project to an entirely new level. Ms. Grove shares some awesome student work on a circle vocabulary project. Check out these Rings and Strings projects from Liza Goldberg! Sally Cosgrove inspires with a volume by slicing project. Mr Gray shares a creative, hands-on task for working with nets of a cube . John Golden combines Quarter the Cross with calculus, and the results are gorgeous! Megan Hayes-Golding shares the power of a math problem to travel and inspire. Sarah Rines shares a project where students design tiles to represent topics studied that year. They make for a beautiful display! I've often had students draw histograms when working with experimental/theoretical probability. But, Joe Benforte has inspired me to have students represent the results using linking cubes in the future as they collect their results. This would make it super easy to combine the results of different groups! Sean Corey shares a WODB involving both fractional and negative exponents. Check out this geometry quilt that Kim Spek's students are sewing! John Rowe shares a brilliant open middle problem for introducing probability. Until next week, keep sharing your awesome ideas! I've already made the announcement on both Facebook and Twitter, but I realize that many of you may have missed it or may not follow me on those forms of social media. So, I guess it's time to make the big announcement here. After six years at Drumright High School, I have turned in my keys and said some tearful good byes. 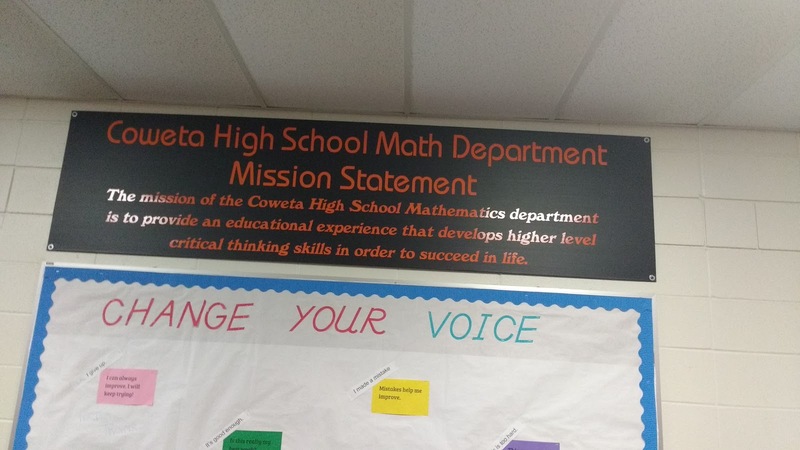 I will be returning to my hometown of Coweta, Oklahoma to teach Algebra 2, Pre-AP Algebra 2, and Pre-Calc at Coweta High School in the fall. I will miss teaching at the school that made me a teacher, but I'm excited to return to the school I graduated from as a teacher. After teaching almost entirely ninth graders for the past couple of years, I'm excited about the switch to teaching upper level math courses. Of course, I'm also a bit terrified because the number of resources I have for these classes pale in comparison to the number of resources I have built up for Algebra 1. Yes, this will be the first time ever in my teaching career that I won't be teaching Algebra 1. I'm a bit sad, but I'm hoping I can learn to love Algebra 2 just as much. If you have any advice/resources for Algebra 2/Pre-Calc, I'd love for you to send it my way! For those of you not familiar with the geography of northeastern Oklahoma, Drumright and Coweta are about an hour apart. My husband has already announced that he will be attending grad school in the fall at the University of Tulsa to earn his masters in Applied Mathematics. Given that he will be attending school in Tulsa and I will be teaching in Coweta, this means that our big project for this summer is to MOVE! Though I've got great plans to blog about everything this summer, that may or may not end up happening with the upcoming move and related craziness. It's Monday. It's the first full week of summer vacation. And given the fact that I know what classes I will be teaching next year (Algebra 2, Pre-AP Algebra 2, and Pre-Calculus/Trig), I am in a full-on search for ideas for next year! I've previously taught both Algebra 2 and Trig, so I'm mainly on the lookout for Pre-Calc ideas. So, if you think that this post has more pre-calc resources than usual, then you're definitely right. 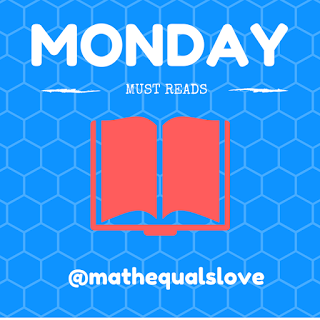 I hope you enjoy this look at this week's "must read" posts on twitter. Vincent Pantaloni highlights some mathematics found on a Swiss bank note. How cool! Ed Southall shares yet another awesome geometric puzzle. John Rowe shares a brilliant lesson based on videos of Russian Egg Roulette. 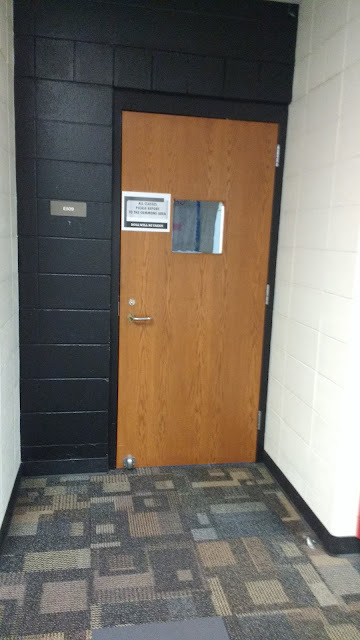 Teaching binary? This video of a mechanical binary counter (shared by Massimo) is amazing. Aline Bègue-Crézé shares some awesome interactive displays involving symmetry. I also love this self-checking activity shared by Aline. Each student in the pair gets a set of problems to solve. They must color their spiral based on their answers. When both students finish, their colored designs will match perfectly if no mistakes have been made. Aline continues to inspire with this activity where seven poor parallelograms were brutally murdered. Students must collect clues to find the identity of the murderers. Jennifer Fairbanks brings out the creativity in her students by including a test question that asks students to make a picture out of a squiggle. Paul Jorgens masterfully combines Fawn's classic Vroom Vroom lesson with the power of Desmos. Paul also demonstrates the power of Desmos when combined with a WODB. David Sladkey shares a great image of the zero product property in the wild. Additionally, David's use of progression tables for graphing quadratics is brilliant. This clothes pin factoring activity from Ms. Wilton looks fab! Ms. Kaub shares a lovely bulletin board that covers the history of math. Need a creative way to motivate solving literal equations? Check out this name project from Ms. Kaub. Nick Corrado uses popsicle sticks to create hands-on geometric proofs. How awesome are these AP Statistics murals in the classroom of Andrew Rosenbloom?!? I've never played Words with Friends before, but I like the idea of using your name's score as part of a regression project. Check out this idea from Andrew Rosenbloom! Want to infuse some poetry into your math classroom? How about trying some Fibonacci poems like Megan A. Uken did? I love this error finding task involving the unit circle from Ms. K! Kerri Homan inspires with a math-themed Christmas craft. It's never too early to start thinking about how you will celebrate this year! This activity from MrsG looks like a lot of fun for trig students. Will your students save the Unit Circle? Mrs. Stelzer shares some impressive student work. Wow. Just wow. Scott Block inspires with this project where students tell their stories using vectors. This vector racing activity (part of a larger BC Calculus Olympics) from Linda Schmidt looks awesome. Chop sticks and post-it notes in math class? Check out this calculus lesson from Maria Hernandez! Valerie Capps encourages students to reflect on what they have learned about the unit circle by having them write haikus. Another inspiring idea from Valerie: students design a nameplate or name sign for teachers in the school. Each letter of their last name is represented by an equation that equals that letter. Each student is assigned a different teacher. From reading some other tweets, it appears that this has become a tradition that is looked forward to every year. One counselor at the school tweeted that she had waited 3 years to receive her sign! Ms. Peterson combines art with parent functions for a fun day in class before break. Mr. Guzik shares a real-world application of trigonometric graphs. Steve Mancuso shares the results of a fun-looking probability project. I love this paper-based lesson on exponential functions from Darcie. Divya Kaushal's students went all-out with this solid of revolution project. I also love how Divya had students write Thanksgiving themed related rates problems! Lynn Kazda shares a simple way to put a smile on students' faces on test day! I've done a 2-D version of this lesson with towers drawn on paper, but I love the idea of illustrating mean as an equal stacking with 3-D manipulatives. Thanks Mrs. Freeland for sharing the awesome idea! Love looking at how the students of Jolene Shotwell brought quadratic equations to life! These calculus volume projects by the students of Meghan Arnold are gorgeous! 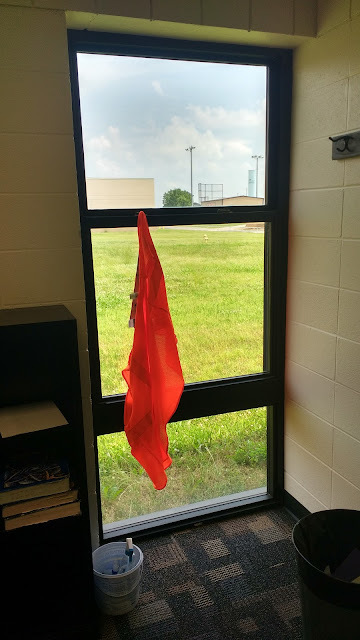 This survival of the fittest activity from Pamela J Burleson looks interesting! Also from Pamela, check out this awesome visual for exponential functions. Rebecca Swanson demonstrates that writing belongs in more than just English class. 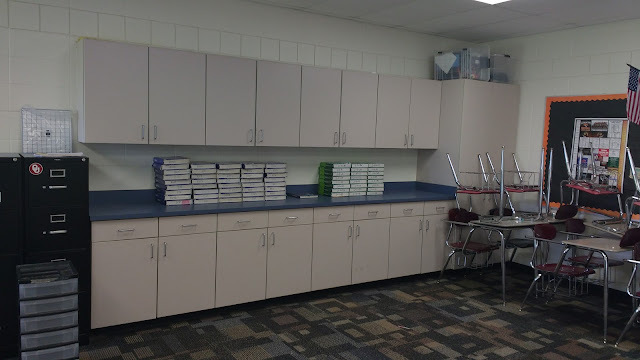 Check out this mini learning gallery from the classroom of Rebecca Swanson. Nellie Dawson demonstrates the power of puns in the classroom. I love Ms. R's idea of making pi necklaces on Pi Day! Have your students learned how to give an asymptote high five? Check out this video from SHS Math Department! Aran Glancy shares a math-ified photo of Minneapolis. Damion Beth shares some awesome locker signs to pump students up for AP Stats testing. Angie Daughtrey shares a creative student project that will have you bursting into song. Tammy Casey showcases some beautiful string art. Every year, Mary Williams amazes me with her themed review days for state testing. Kristen Fouss shares a quick and easy way to gather end-of-year feedback. Lisa Richardson has got me thinking that I need to start planning outfits around activities in class. Of course, I don't know if I could compete with this adorable activity! Deb Bulin inspires with a geometry project involving kite flying. Jae Ess shares a beautiful slope display created by her students. Sophie Kasahara has students create posters to wrap up their week of inspirational math. 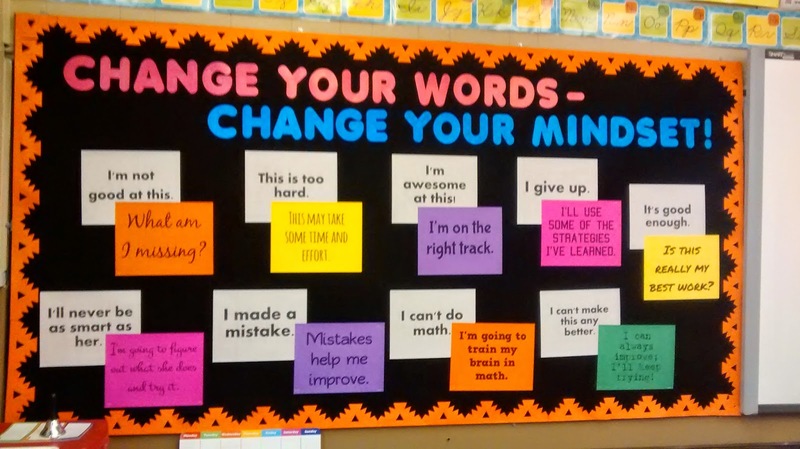 Love the reminder that these posters will serve to students! I'm not entirely sure what's going on, but this activity from Beatriz Nino has me mesmerized. Nicole Ayers has students interact with some real-world (and very depressing) data. Howie Hua shares some sage teacher wisdom. Ryan White shares a simple but effective probability warm-up. Paul Smith shares a creative set of volume problems. Stephanie MacKay makes sure you know you're entering a math classroom right away. Love it! I am continually amazed at what students come up with when assigned a Wheel of Theodorus (or Spiral of Pythagoras) project. Check out this work from the students of Martin Joyce! Wendy Bartlett shows the application of quadratics in relation to golf. Christopher Klerkx shares some student work that will make you think! I love this beautiful math goals display from Renee Chipman! Julia Anker's combination of tracing paper and the unit circle is pure brilliance. Props in math class make any lesson better. Check out cLarsen's use of her daughter's clothes to illustrate combinations. Annie Giercyk shares a creative way to practice finding the area of a trapezoid. Happen to be teaching the surface area of cones on wacky hair day? Then, Roy Tomlinson has an idea for you! Not so lucky to have those two very specific events collide? Here's another lesson idea from Roy that can be used any day. Do you think that you could tell the difference between a brown M&M and a colored M&M without looking? Patrick Flynn shares a great notice/wonder image for properties of logs. This fractional exponents/radicals exploration activity from Mark Kaercher is truly a beautifully structured lesson. 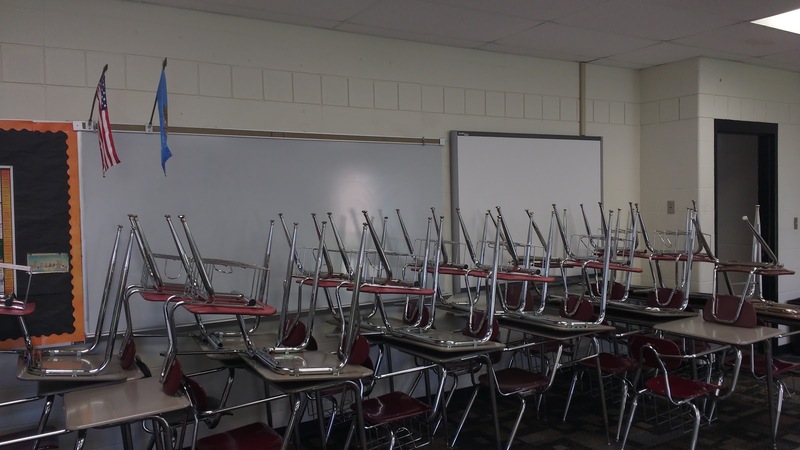 Are your seniors contemplating a prank? Have them do the math to find the cost! LOVE this idea from Stephen Dull! Working with parallel and perpendicular lines? Prof Maths suggests having your students make some Mondrian artwork. James Edstrom helps students keep their parent functions separated in their minds by creating a family album of sorts. James also shows that Play Doh has a place in the secondary classroom. Carolyn Lantos shares a Thanksgiving-themed system of inequalities. Laura Frcka shares a new-to-me idea for Pi Day: pin the radius on the circle. Marianna Jennings shares a Valentine's STEM project. Peg Cagle shares an exploration involving Zometool (affiliate link). I continue to be amazed by the development of this space-filling project by David Butler.